Erin's Dream for Eryn - monemades Webseite! I've finished this a while ago, but now that it is safe and sound in the hands of its recipient, I finally can share pictures with you. 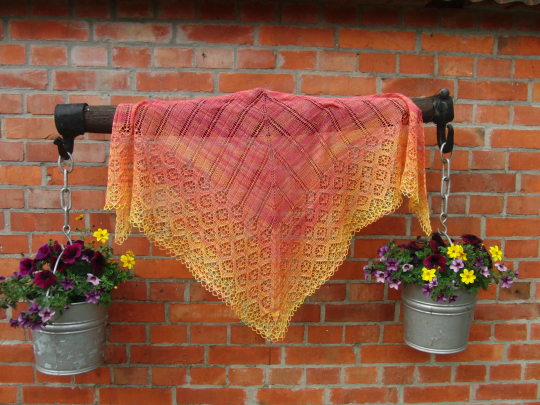 I made this shawl for my Canadian friend Eryn's birthday and like always Canadian customs and post made me worry a lot that my package might not make it in time. But it did - and Eryn loves her new shawl. 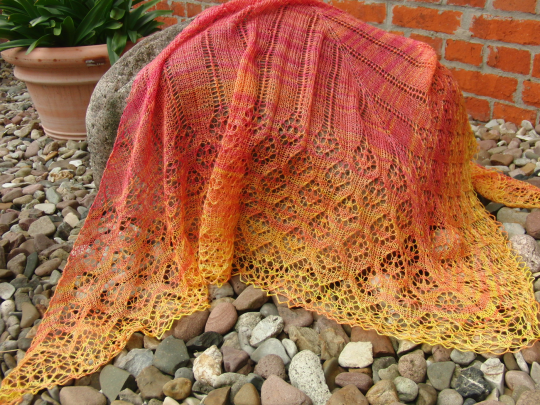 The pattern is Angarika by Po Lena and I chose it the minute I saw it in Eryn's favourite list on Ravelry. When I started to look for the perfect yarn I almost ordered something else, but than I came across The Unique Sheep's colourway 'Erin's Dream' and really, that was meant to be, wasn't it? Especially because Eryn loves orange and yellow. Really happy Eryn is so happy with her new shawl.